These crock pot great northern beans are made with dry beans and an assortment of vegetables. It's a versatile recipe, and you can easily change the seasoning vegetables. Or add some ham or bacon to the beans. The beans pictured were cooked in the slow cooker with no pre-soaking or cooking, and they cooked perfectly. If you regularly have trouble with beans becoming tender, go ahead and soak them overnight. Or do a quick-soak (on the package of beans) and simmer a bit before you add them to the slow cooker. Though many say salt does not have an impact on the tenderness of the beans, add it near the end of the cooking time and after the beans have become tender. 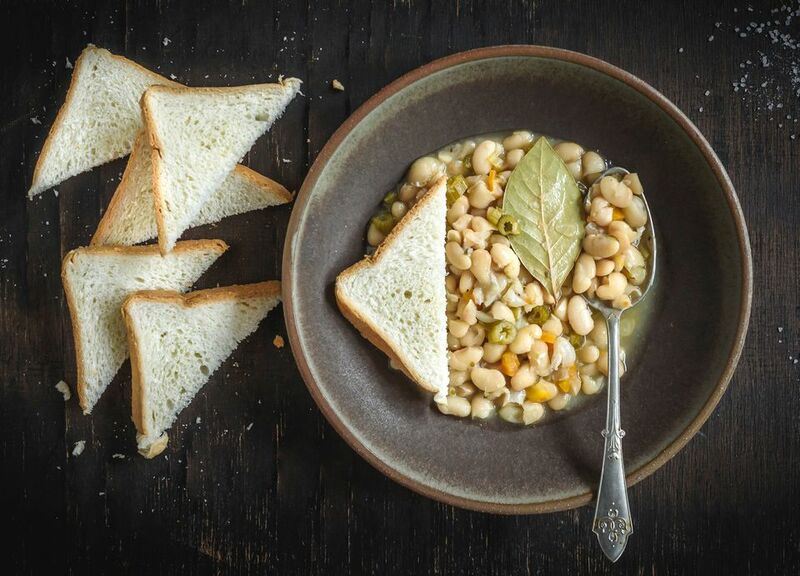 The herb and vegetable mixture in these great northern beans season them perfectly, and the slow cooker makes it super easy. Rinse the beans well and pick them over. Discard any malformed beans or any small stones you might find. I have actually found small stones in dry beans, so always look them over as you rinse. Transfer the beans to the slow cooker. Add 1 1/2 quarts of water to the pot. Add the onion, carrot, celery, bay leaves, garlic, celery flakes, parsley sprigs, and the freshly ground black pepper. Cover and cook on LOW for 5 1/2 to 6 1/2 hours. The beans pictured were quite soft after 6 hours, but the age of the beans, the hardness of your water, etc., can make a difference. Add kosher salt, to taste. Serve the beans over rice, in salads, in chilis and stews, in soups, or mash them to use in dips or as a spread for crostini appetizers. They are perfect for use in any recipe that calls for canned great northern beans. Store leftovers in the refrigerator for up to 4 or 5 days or freeze them (see below). The beans can be frozen in freezer containers to be used in recipes later. Chill the beans and pack them in containers with their cooking liquid. In 1-pint containers, leave about 1/2-inch of headspace to allow for expansion. Allow about 3/4- to 1-inch of headspace to allow for expansion if you are using narrow mouth containers. You may also freeze beans in zip-close bags. Dice about 1/4 pound of salt pork and add it to the slow cooker along with the vegetables. Add about 1/4 cup of diced bacon to the beans. Add about 1/2 cup of diced ham or a ham shank to the beans.